President of the Senate/Lt. Gov. The Democratic Party currently holds supermajorities in both houses of the California State Legislature. The Assembly consists of 61 Democrats and 19 Republicans, while the Senate is composed of 28 Democrats and 10 Republicans, with two vacancies. Except for a brief period from 1995 to 1996, the Assembly has been in Democratic hands since the 1970 election. The Senate, meanwhile, has been under continuous Democratic control since 1970. New legislators convene each new two-year session, to organize, in the Assembly and Senate Chambers, respectively, at noon on the first Monday in December following the election. After the organizational meeting, both houses are in recess until the first Monday in January, except when the first Monday is January 1 or January 1 is a Sunday, in which case they meet the following Wednesday. Aside from the recess, the legislature is in session year-round. Members of the Assembly are elected from 80 districts and serve two-year terms. All 80 Assembly seats are subject to election every two years. Members of the Senate are elected from 40 districts and serve four-year terms. Every two years, one half of the Senate (20 seats) is subject to election, with odd-numbered districts up for election during presidential elections, and even-numbered districts up for election during midterm elections. Term limits were initially established in 1990 following the passage of Proposition 140. In June 2012, voters approved Proposition 28, which limits legislators to a maximum of 12 years, without regard to whether they serve those years in the State Assembly or the State Senate. Legislators first elected on or before June 5, 2012 are restricted by the previous term limits, approved in 1990, which limited legislators to three terms in the State Assembly and two terms in the State Senate. The proceedings of the California State Legislature are briefly summarized in regularly published journals, which show votes and who proposed or withdrew what. Reports produced by California executive agencies, as well as the Legislature, were published in the Appendices to the Journals from 1849 to 1970. Since the 1990s, the legislature has provided a live video feed for its sessions, and has been broadcast statewide on the California Channel and local Public-access television cable TV. Due to the expense and the obvious political downside, California did not keep verbatim records of actual speeches made by members of the Assembly and Senate until the video feed began. As a result, reconstructing legislative intent outside of an act's preamble is extremely difficult in California for legislation passed before the 1990s. Since 1993, the Legislature has hosted a web/ftp site in one form or another. The current Website contains the text of all statutes, all bills, the text of all versions of the bills, all the committee analyses of bills, all the votes on bills in committee or on the floor, and veto messages from the Governor. Before then, committees occasionally published reports for significant bills, but most bills were not important enough to justify the expense of printing and distributing a report to archives and law libraries across the state. 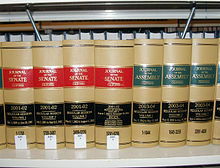 For bills lacking such a formal committee report, the only way to discover legislative intent is to access the state archives in Sacramento and manually review the files of relevant legislators, legislative committees, and the Governor's Office from the relevant time period, in the hope of finding a statement of intent and evidence that the statement actually reflected the views of several of the legislators who voted for the bill (as opposed to just one). Drafting. The procedure begins when a Senator or Assembly Member decides to author a bill. A legislator sends the idea for the bill to the California Office of the Legislative Counsel, which drafts it into bill form and returns the draft to the legislator for introduction. Introduction or First Reading. A legislator introduces a bill for the first time by reading or having read: the bill number, name of the author, and descriptive title on the floor of the house. The bill then goes to the Office of State Publishing. The legislator can't act on a bill, except the Budget Bill, until 30 days after its introduction. Committee hearing. After introduction, a bill goes to the rules committee of the house, which assigns it to the policy committee appropriate to the subject matter, for its first hearing. During the committee hearing, the author presents the bill to the committee, which may hear testimony in support of or opposition to the bill. The committee then votes on whether to pass the bill out of committee, or that it be passed as amended. Bills may be amended several times. It takes a majority vote of the committee membership to pass a bill and send it to the next committee or to the floor. The Fiscal committee reviews the bill if it contains an appropriation or has financial implications for the state. A second reading on the floor of the house happens when a bill is recommended for passage. Ordinarily there is little or no debate. If a bill is amended at this stage, it may be referred back for another committee hearing. ^ The California Constitution was amended by voters in 2004 to include a balanced budget amendment that allowed the minority party to negotiate sizable budget cuts, versus revenue increases, by not providing enough votes to pass a budget if certain demands were not met. 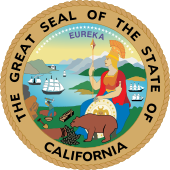 In 2009, when California faced a major revenue crisis due to the global economic downturn, the state was forced to issue revenue anticipation warrants ("RAWs", or more commonly, "IOUs") for two months because it lacked budgetary authority to issue payments. 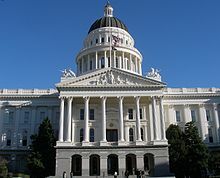 In 2010, California voters again amended the state's constitution with the approval of Proposition 25, which lets a simple majority pass an "all cuts budget" to meet the balanced budget requirement, and provide budgetary authority to issue payments and avoid revenue anticipation warrants, but continued the requirement of a two-thirds vote to increase revenues and reduce budget cuts. ^ a b "California Constitution Article IV § 2". California Office of Legislative Counsel. Retrieved February 23, 2019. 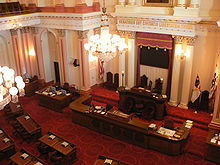 ^ "Full- and Part-time Legislatures"
^ "California Constitution Article IV § 3". California Office of Legislative Counsel. Retrieved February 23, 2019. ^ "Legislative Publications". California Office of Legislative Counsel. Retrieved February 23, 2019. 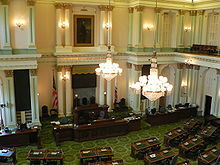 ^ "California Legislative Information". California Office of Legislative Counsel. Retrieved 23 February 2019. ^ "Overview of Legislative Process". California Office of Legislative Counsel. Archived from the original on February 23, 2019. Retrieved February 23, 2019. ^ Siders, David; Miller, Jim (2016-09-22). "Override Jerry Brown's veto? Not likely to happen". The Sacramento Bee. ISSN 0890-5738. Retrieved 2018-09-04.